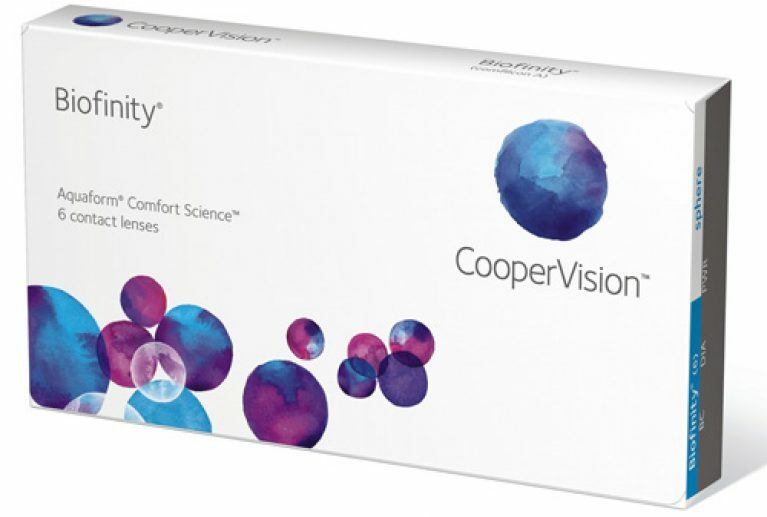 Biofinity Toric contact lenses are disposable soft contacts from CooperVision. Each packet includes 6 comfortable lenses made from high-performance silicone hydrogel. This unique material helps lenses to stay moist all day long, so they aren’t drying on the eyes. The hydrating lenses provide a more comfortable wear, especially for long-term usage. The patented Aquaform technology makes the lenses hydrophilic or ‘water loving’, so they naturally retain moisture. Not only does this improve comfort, but also helps to keep your eyes looking healthy and white. The Aquaform material creates hydrogen bonds with surrounding water molecules, creating a layer of hydration around and within the lens. This is what makes it so soft and resistant to dehydration. It also helps to reduce the build-up of annoying protein deposits. What Are Biofinity Toric Contact Lenses? In the past, it wasn’t possible for people with astigmatism to wear contact lenses. The technology simply wasn’t available to allow them to adapt to the curvature of the eye. The irregular eye curve that characterizes astigmatism meant it was challenging to design contact lenses that correctly fit. However, Biofinity Toric contact lenses have been specifically for those who have this unique eye condition. The ballast now comes with a better design to provide a stable orientation, which ensures clearer vision. It helps to avoid movement of the lens around the eye or uneven rotations that can sometimes come up due to blinking. If you enjoy being active and playing sports, then you don’t need to worry about blurry or distorted vision holding you back. Biofinity toric contact lenses work differently to normal contact lenses. They help in correcting astigmatism and have several features that help them do this. They’re made from a highly breathable type of silicone hydrogel. This makes them soft so that they can conform to the unique shape of an eye with astigmatism. The material is also gas permeable so that plenty of oxygen can move in and around the lens. Biofinity Toric contact lenses differ from regular spherical contact lenses in the way they work too. Unlike regular lenses, Torics feature varied strengths at different meridian points, which allows them to correct vision for both nearsightedness and farsightedness. Contact lenses for astigmatism are usually a bit more expensive than regular ones. Although this may seem unfair if you’re buying them, it’s for several valid reasons. The first is that they feature a more complicated structure, so they cost more to design and produce. The material they are made from, construction of the lens, and retailer that you buy from will all impact the amount you pay overall. The expertise required to fit astigmatism contact lenses is also of a higher level than the fitting of standard lenses. An eye doctor who is a specialist in astigmatism may well cost more than a normal consultant. Although these factors can increase the cost of wearing contact lenses, most people agree that it’s well worth the money for clear vision. The price of Biofinity Toric contact lenses is usually around $65 for a box of six lenses. We’ve found that Coastal tends to offer the lowest price once you take into account their free delivery. You can also get a discount if your order value is over $99, so it can be worth taking advantage and stocking up with several boxes. Coastal also has a more fair and flexible return policy than other retailers, so are often the best value overall. Astigmatism is an eye condition that you can manifest in many diffferent ways. Because of this, people with astigmatism won’t necessarily all have the same requirements. 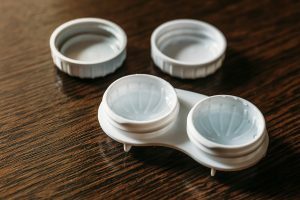 Every pair of eyes has specific characteristics, therefore it’s important to find a contact lens product that fits your unique needs. This element of individuality can result in people needing to try out several different contact lenses in order to find the right type. It’s often a case of trial and error that leads people to a brand they love and design that ticks all of their boxes. However, learning from other people’s experience can be a shortcut to finding the right type for you. It can save you both time and money by helping you avoid lenses that won’t be suitable. So we’ve created an in-depth review of Biofinity Toric contact lenses to help you decide. This may be the single most important element of a good contact lens. After all, if it’s not enhancing your vision then it’s not really doing its main job. With Biofinity toric contact lenses, there are no concerns on this front. One of the most frequent comments about them is how they deliver 20:20 vision for people who use them. The breathable lenses allow a steady flow of oxygen to your cornea, so you’re able to appreciate the smallest details of what you look at. Thanks to the natural lens shape, light is evenly reflected on the retina, which produces an enhanced resolution and depth perception. The ballast design facilitates clear vision that fits your lifestyle. So, whether you travel a lot or participate in active sports, you can enjoy crystal clear vision on the go. Biofinity Toric contact lenses are ideal for periods of extended wear. The soft hydrogel material and moisture-retaining design mean that they won’t dry out or irritate your eyes. So, if you’re someone who prefers to wear contact lenses for several days in a row, then these lenses are a great solution. People with sensitive eyes have even reported wearing them for up to 30 days without experiencing any adverse effects. The beauty of Biofinity Toric contact lenses is that you don’t need to clean them every day. 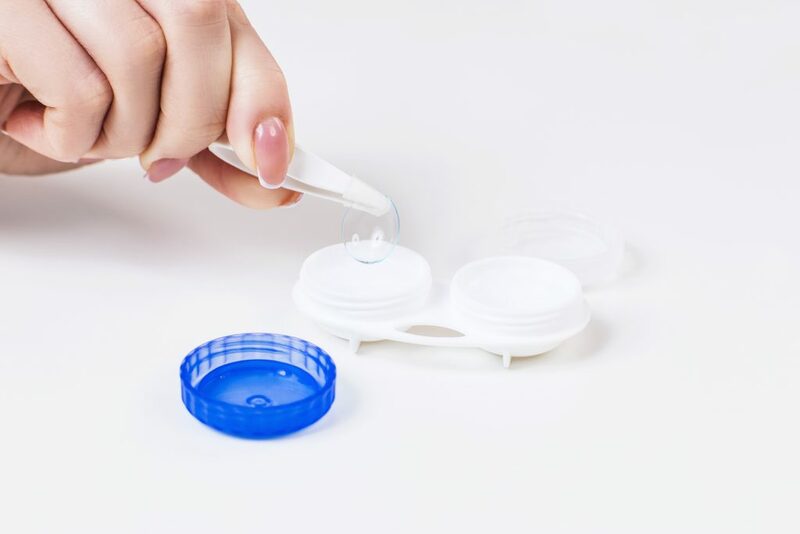 If you travel a lot or just don’t like the hassle of cleaning solutions, then 30-day contact lenses are a practical option. There’s no need to remember cleaning accessories on business trips or figure out how to sterilize them if you’re camping. Just pop them in and then forget about them! Biofinity toric contact lenses are very comfortable to wear. They receive consistently positive feedback on their levels of comfort, with many people stating that they often forget that they’re even wearing them. Others have reported that they’re the most comfortable lenses that they’ve ever worn. This kind of feedback makes them particularly promising in terms of comfort. The high comfort ratings reflect the hydration of the lenses. They retain moisture which stops your eyes drying out or getting itchy towards the end of the day. The hydrogel means they’re soft and pliable, so they adapt to the shape of your eye. This product fits your unique needs, no matter what type of astigmatism you may suffer from. If you’re based in an area of the USA with a dusty or dry environment, then Biofinity Toric contact lenses should suit you well. Part of the comfort is also due to the steadiness of the lenses. The ballast design helps to avoid shifting so that your contact lenses are less likely to move around or rotate when you blink. The stability of their orientation and optimized lens geometry means you’ll enjoy clear vision without the annoyances that other contacts can cause. In comparison to other contact lenses, there are actually very few drawbacks that have been reported by users. The small number of negative comments is a testament to the quality of the materials and overall design of the product. In the few cases where people weren’t quite happy with the lenses, it was usually due to one of two issues; dryness or tearing. 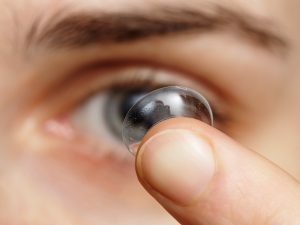 A small number of people reported that Biofinity toric contact lenses caused their eyes to become drier. It’s surprising given the hydrogel formula and water-retaining properties, but everyone’s eyes are different and even top products won’t be suitable for everyone. This highlights the importance of trying out contact lenses for yourself. Despite the huge number of people who find them comfortable and hydrating, a minority still experience dryness. So it’s worth testing out a trial pair once you’ve narrowed down your choices. A few other people have also reported that the lenses tear easily and have questioned the quality of the product. However, far more people have stated that they’re easy to put in, so we’re inclined to put this down to personal experience rather than quality issues. If you suffer from astigmatism and also have sensitive eyes, you might think your contact lens options are even more limited. It’s true that some brands can irritate sensitive eyes more than others, so finding the right one is crucial. However, Biofinity Toric contact lenses get rave reviews from people with sensitive eyes. Many people comment on how gentle they are in comparison to other contact lenses. The soft silicone material and hydrogel lubricant ensure that they don’t exacerbate sensitivities or dry out the eyes. The water-loving or ‘hydrophilic’ design means that it’s mostly good old H20 that hydrates your eyes, rather than chemical compositions with the potential to irritate. Biofinity toric contact lenses have some of the most positive reviews of all the options currently available. Their soft silicone design means that they’re suited to a varied range of astigmatism types and will adapt to fit the unique needs of different people. The water-loving hydrogel retains moisture so that they can be worn comfortably for days or weeks at a time. Their ballast stabilization design minimizes lens shifting so that every detail and feature is optimized. It also avoids the uncomfortable situation of having a lens unexpectedly rotate around your eye, just when you least expect it. Details like this make Biofinity toric contact lenses reliable and enjoyable to wear. They’re also an ideal option for people who prefer extended wear lenses. They won’t irritate your eyes, even after several days, and help you avoid the hassle of cleaning solutions. Contact lenses that are designed to correct for astigmatism do tend to cost more than standard lenses. Depending on your budget and replacement schedule, you’ll want to shop around to get the lowest price. However, we’re confident that Biofinity Toric contact lenses deliver exceptional value for money, based on the clear vision and exceptional levels of comfort they provide. The best price we found was available via Coastal for $65 at the time of writing. Although prices can change, this site provides consistently outstanding customer service and offers a fair refund policy.